Getting ready for an interview? Here are some interviewing tips that might help. – Identify your accomplishments before you go on an interview.Think of the company benefits and results you have achieved. – Don’t let your guard down. – Answer the interviewer’s questions in a direct and concise manner. – Dress in a manner that your position calls for. 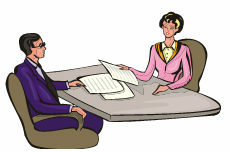 – Maintain direct eye contact with the interviewer; this shows confidence. – Develop questions that demonstrate interest in working with the company. – Send a thank-you letter to all individuals with whom you interviewed. – Be aware of your language. Avoid vocal fillers such as “you know” or “um”. – Answer questions within 60 seconds or you will lose your listener. – Be prepared, but don’t sound rehearsed. – Remember that you are interviewing the company as well. – Be prepared to expand on the information you provided in the resume. – Always show up on time. – Be honest but careful of what you are saying. – When filling out a job application, be sure to read and follow the instructions. – Be polite and positive. – Research interview techniques and prepare. – Listen carefully to the questions that are asked and answer the question. – Maintain a positive and upbeat demeanor. – Don’t go off on tangents. – Be aware of your tone and body language. – Establish rapport with the interviewer. – Don’t interrupt the interviewer when she or he is speaking. – Expect to be nervous. – At the end of the interview, ask the interviewer what the next step will be. – Know the organization’s needs and culture before the interview. – Don’t speak negatively about your present or past employer. – Be prepared to answer, “Why did you leave your last company?”. – Wait until you are offered a seat before you sit down. – Interact with the interviewer; don’t react. – Pace yourself; if you need extra time to think of an answer, take it. – Write down your thoughts of the interview immediately after it is over.